My boyfriend bought this for me for my birthday (in addition to a Tiffany’s necklace. Yeah, I know I’m lucky, he’s the best!) and I was instantly impressed. 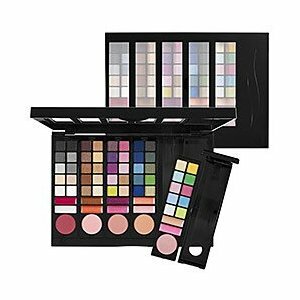 There are 5 removable palettes that can be placed in an included carrying case. There are 10 eye shadows, 2 lip colors and 1 blush in each palette. The great thing is, all the colors are usable! Usually when you purchase a set like this there are only a few colors you use – this set is not the case! The shadows are colors that flatter all eye colors and the blush seems to flatter all skin tones – Can we say versatile!? I haven’t used the lip colors yet for fear of creating a mess, but I think when used with a lip brush you shouldn’t have any problems. The quality of the eye shadows/blush is amazing. The colors are vibrant and the formula lasts all day. Each palette is designed around a theme so finding colors that look good together is a breeze. Really I just can’t say enough good things about this set. Visit the Sephora Web site or Click here if you’re interested. All the stores near me seem to be sold out – for a good reason!